A hard rock album. The Decca release, in particular, is ultra-rare and very sought-after by collectors of this genre. In fact the album is perhaps the most expensive major label album of the 'progressive' era. Their vocalist Pete French, a South Londoner, played with his cousins Mick Halls in various rock/blues outfits like Switch and Joe Poe before teaming up with Bob Brunning to form the Brunning Sunflower Blues Band. By 1969, French had moved on to Black Cat Bones and Halls later joined him. Then, in the latter half of 1970, they evolved into Leaf Hound. The album's name is very misleading. Anyone expecting an acid rock classic from the title and cover of the UK release is going to be very disappointed. This is driving hard rock in the Led Zeppelin mould which is only likely to appeal to fans of this genre. Nonetheless French's voice is raw and strong ideally suited to music of this type and the album is full of driving, incisive guitar work from Mick Halls and his colleagues. This is particularly evident on tracks like Drowning My Life In Fear, Stagnant Pool, Sad Road To The Sea and A Minute To Go but there are no weak cuts on the album. 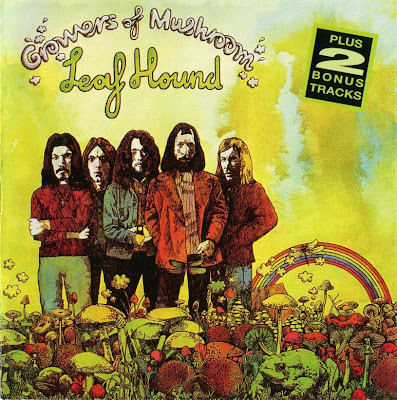 During their short time together Leaf Hound got to tour Germany and their album was licensed to Telefunken for German release before it was put out in this country. Inexplicably the German release omitted two cuts:- Freelance Fiend and the title track but it did come with a poster of the band. Telefunken also issued one of the album's strongest tracks Drowned My Life In Fear on a 45 backed by a non-LP song It's Going To Get Better (Telefunken U 56 154) in a picture sleeve in 1971. The Telefunken album release was pirated a few years back. After Leaf Hound's demise French was briefly in Big Bertha, then joined Atomic Rooster. He later figured in US boogie band Cactus before returning to the UK to join Randy Pie. He played on their three German-only 1977 albums and put out a solo album and 45 the following year which were only released in Germany. No it is too rare. Any chance of posting any of the 1977 German Pete French solo albums mentioned in the text? YOU ARE THE KING, SIR!! !